Last week we had the privilege of spending a few days on the beach on Assateague Island in Virginia. The beach there is spectacular as it’s a national seashore and virtually undisturbed by man. 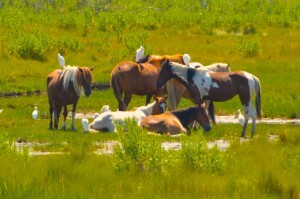 There are no houses on Assateague, only wild ponies, lots of birds, a few mosquitoes and a beautiful shoreline. I couldn’t help notice the man on the beach next to us. He was there with his wife and three beautiful children who were enjoying every aspect of the beach. However he spent the majority of his time on his cell phone, either checking his email or making work phone calls. Now void of being judgmental because there may have been a really good reason this guy was so attached to his cell phone while he was on the beach, it reminded me of the importance of being present, being here now. Being in the present moment is a concept based in mindfulness that I talk about quite often but I couldn’t ignore the opportunity to talk about it again. If not conscious, we spend the majority of our lives living in the past or future, very rarely in the present moment. Anxiety and worry stem from past or future-thinking. Most of what we fear and are worried about never happens yet we spent an exorbitant amount of time doing so and it creates S.T.R.E.S.S. Everywhere I look I see people so fixated on their devices that they are missing their lives. Your life is right here in front of you, right in this very moment. We think that there is something better, “out there” and we don’t want to miss it. Being in the present moment takes practice to pull ourselves back from the searching, longing and craving of something we believe is superior to the here and now. So how does paying attention to the breath bring you to the present moment? You can’t notice your breath and be worrying at the same time. We can’t be in two places at once. If your mind is catapulting you to worry about a patient, client or a coworker, all of which is taking you away from your actual experience. Often our actual experience is being in the presence a of a loved one; our child, partner, friend or family member. There is no greater gift you can give another than your presence. The other night my husband and I went to a restaurant for dinner. This particular restaurant was very small with only about six tables in it. That night only four of the tables were filled and at each table either one or all diners were on their devices. I noticed a couple where the gentleman spent more time on his phone than speaking to his companion. Now perhaps he is awaiting a organ transplant and just wanted to see if a donor had come through. I have to believe his doctor would call him if that was the case! At another table two men were totally hypnotized by their tablets. I never saw them speak to each other. All missed the present moment. The moment that will never come again and is now lost forever. Again we cannot be in two places at once. We can’t be on our device and with the people or person we are actually with. We can try. We can fool ourselves that we are but we can’t. And deep inside our heart suffers, longing for a true connection which can only happen when we are truly present. The present moment is all we really have. The past is gone, the future has yet to unfold and almost guaranteed not to unfold in the way we are worrying about anyway so stick with what is right before you and when it slips away, gently bring your attention back to your breath. Your heart will thank you.